This is a card game for up to 10 players, so there are a lot of cards. Each player gets a set of cards representing the movie character he or she will be playing. There's also a set of Goblet cards, enough for each player to have one to choose from. And a Time card that tracks the rounds. There are also a set of Sicilian Wine cards that don't belong to anyone. Each player snags a set of cards with the matching character card of their choice (we'll talk about what the cards do shortly). The dealer will shuffle and deal 2 Sicilian Wine cards to each player. 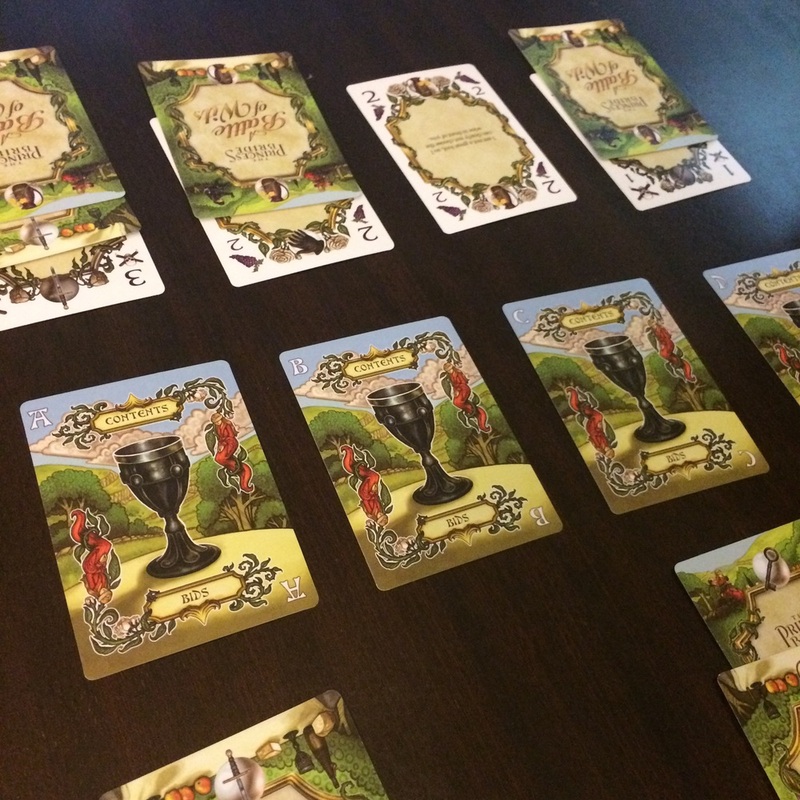 Then a Goblet card is set out, enough for each player to eventually have one goblet in front of them. Each set of cards that the players hold consists of the exact same cards: some are poison, some are wine, and they each have varying numeric values. The randomness thrown in is the two cards dealt from the Sicilian Wine cards, and the only difference in the cards is the icon on each them indicating which player/character played which card. On a player's turn he or she simply plays one card to a goblet of their choice. The can play them as a bid, bidding on a goblet, or as contents, placing either wine or poison into the goblet. This takes place until the players have all placed their cards, however each time play comes back to the dealer the time card is flipped from day to night, and night to day, and so on. Every time it's flipped to the day side the closest contents card to each Goblet is revealed, giving everyone just a tiny bit of information about why someone is or is not bidding on a particular goblet. Once everyone has played their cards the bids are resolved. To figure out who won the bid for each goblet, you simply add up the numeric value of each icon present in the bid stack, highest bidding player wins. Sometimes players can and will win more than one goblet, in that case they get to choose which one they want to drink from, and the player(s) who didn't win one get the choice of the leftovers. Now it's time to drink. Again going goblet by goblet the contents are flipped over, and if the total value of poison cards is more than the total value of wine cards, you die. If not, you live. The base rules state that all players who lose flip over the character card to the poisoned side, and then there are subsequent rounds etc. The variant that we chose (because we wanted a single player to win) was to subtract the poison total from the wine total and the player who had the most wine was the overall winner. It's no surprise that I was excited to give this one a whirl, I'm a fan of the movie, and the theme is very intriguing to me. I also like bluffing/deduction type games, so again this was right up my alley. And I have to say, mechanically, the game really and truly embraces the theme of the Battle of Wits seen in the movie. I had two somewhat bigger issues with the game that I'll tackle first and then I'll tell you more about what I liked about it! The first might be obvious. We chose to use the variant win condition instead of the one suggested as the base win condition. The group I played with was definitely not OK with having multiple winners. It's not a team game so that felt weird to us (although there is a team variant), but it felt like there were maybe too many variants, instead of just one great way to play the game. It's not a big issue, and I know many gamers like to have multiple ways to play the same set of cards--it adds replayability. 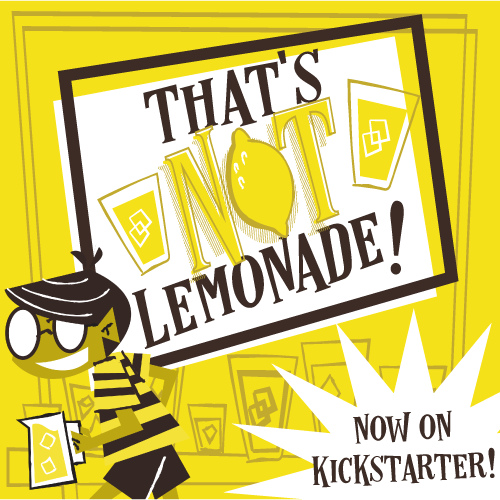 The major issue that we struggled with was the art/graphic design. The card backs feature an icon for each character, along with a TON of frilly decorative borders, and artwork, and titling etc. It's very pretty artwork, but during gameplay being able to quickly and easily identify whose cards are where is key to deciding your play. The artwork detracted from that very much. The back of the cards are very "busy"--so much so that the first time I leafed through them before looking at the rule book I didn't realize there were different icons on them. But is the game fun? Yes, once we got the game up and running I enjoyed the clever interweaving of theme and mechanics, and being able to play up to 10 players makes it a great party/non-gamer game. The gameplay is pretty streamlined and easily accessible. Plus the fact that it has a really fun and entertaining theme around it makes it great for use as a gateway game for social deduction/bluffing games--and for those friends of yours who are big Princess Bride fans but maybe not big gamers. While I feel there should have been a bit more development with the graphic design--particularly on the backs of the cards--the game play is fun and clever, and the variants do give some flexibility to cater the game to your particular group. A Battle of Wits is a definite must for big fans of the movie who are looking for a quick filler to introduce these games to your friends! Have you played A Battle of Wits? Any thoughts? Let's chat in the comments below!